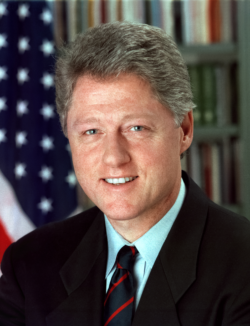 The first major immigration issue faced by President Bill Clinton dealt with Haitian refugees who were being held at Guantanamo Bay, Cuba after being rescued by the U.S. Coast Guard. After campaigning against the policy of repatriation, Clinton reversed course and maintained it. By 1994 tens of thousands of Haitians and Cubans were held in a refugee camp at Guantanamo Bay. In 1996, Clinton signed two Republican-sponsored bills that had a significant effect on immigration policy. Together, the Antiterrorism and Effective Death Penalty Act and the Illegal Immigration Reform and Immigrant Responsibility Act of 1996 significantly increased the potential penalties faced by immigrants both with and without formal immigration status. The laws expanded the number of crimes for which immigrants (including green-card holders) could be deported, and made the deportation eligibility retroactive. The laws also allowed undocumented immigrants apprehended within 100 miles of the U.S. border to be deported without arguing their cases before an immigration judge. The final major immigration-related issue of the Clinton years was the fate of Elián Gonzalez, a six-year-old Cuban who was rescued at sea after his mother drowned attempting to take him to the United States. Although Elian’s mother’s Cuban-American relatives demanded custody, U.S. courts sided with his father, who requested to be reunited with his son in Cuba. After Elian’s American relatives refused to surrender him, U.S. immigration officials forcibly removed Elian from their Miami home in a controversial pre-dawn raid. Although a majority of Americans believed Elian should be returned to his father, the handling of the raid proved damaging for the Clinton administration.